While Louisiana may best be known for its tasty Cajun cuisine, antebellum plantation homes and, of course, the wild party known as Mardi Gras in New Orleans, it also offers a ton when it comes to nature and wildlife. As the home of 40 per cent of America’s wetlands, with more rivers, lakes and bayous than you can count, it’s no surprise that this state is inhabited by countless animal species like alligators, including one of the world’s rarest: white alligators. Herons, egrets, ibis, bald eagles, tortoise, fox and the Louisiana black bear are just a few among a long list of others that you might be able to glimpse while you’re here. There are some spectacular natural attractions that can be found throughout Louisiana too, from swamps and islands to national forests, refuges and even mountainous terrain. Arrive in the spring or early summer and you can enjoy the famous Cajun crawfish boils in between taking in some of the best nature and wildlife the state has to offer. Be sure to put Avery Island on your must-visit list. This destination is likely to be familiar, or at least its name, which is on every bottle of Tabasco sauce, something that can be found in more than 180 countries across the globe. While touring the factory to see how the iconic sauce is produced is a must, the nature and wildlife is really the highlight. Jungle Gardens is a top attraction here, a semi-tropical garden that spans along Bayou Petite Anse offering visitors the chance to enjoy all sorts of botanical treasures and wildlife. This beautiful nature reserve is home to countless birds, including thousands of snowy egrets that nest in Bird City, as well as wildlife like deer, alligators and raccoons. The nesting season for the egrets starts around February, but the birds remain on the island through December. President Roosevelt once described the reserve as the “most noteworthy” in the nation. Nestled along southern Louisiana’s coast is the little town of Grand Isle, the only inhabited barrier island in the state. It’s made up of seven miles of white sandy beaches, chenier forests and marsh habitat, located at the mouth of Barataria Bay where it meets the Gulf of Mexico. There’s only one way in and one way out, other than travelling via a float plane or boatthe elevated bridge that links Port Fourchon and Leevile. 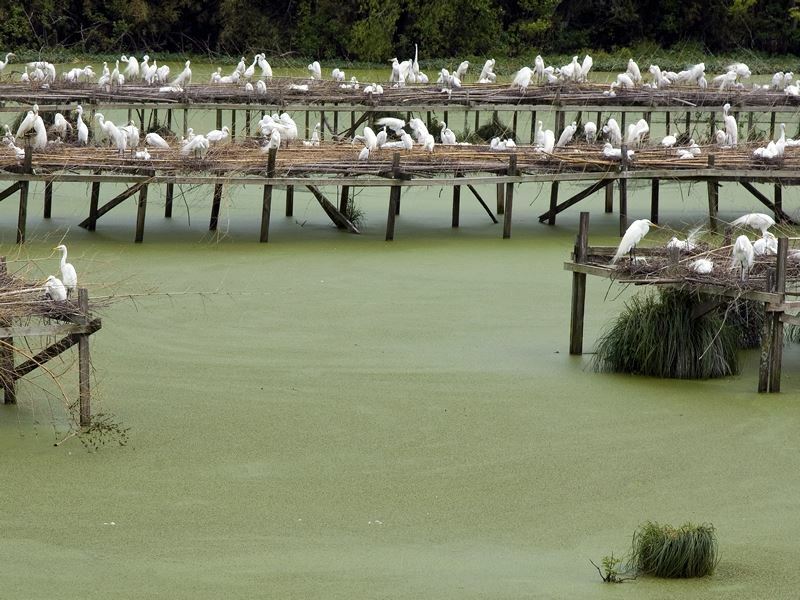 A bird lover’s paradise, some 2.5 million birds pass through this region on their way to breeding grounds. The Grand Isle Birding/Nature Trail showcases five bird watching locations, bringing the opportunity to view state’s official bird, the brown pelican, as well as some 100 species of herons, tanagers, songbirds, grosbeaks, sandpipers, and more. At the Butterfly Dome, you’ll be able to marvel at nearly 140 species of butterfly native to Louisiana – pick up a brochure with photos and descriptions of each one and see how many you can find. The Elmer Island Wildlife Reserve features coastal dunes and beaches as well as a back bay that’s surrounded by saltwater marsh and mangrove habitat. You can view a variety of bird species here like black skimmers, reddish egrets, piping plovers, marbled godwits and magnificent frigatebirds. Not to be confused with Italy’s version, this Venice is an entirely different world, in fact, it’s sometimes called “The End of the World” as it’s the southern terminus of the Great River Road. Sadly, much of the city was devasted Hurricane Katrina, but since then the community has been rebuilt and is thriving once again. It’s not only one of the most popular departure spots for offshore fishing, it provides easy access to the Breton National Wildlife Refuge in the Chandeleur Islands. The refuge offers critical habitat and nesting grounds for about two dozen species and sea birds and shore birds, including brown pelicans and a large tern colony. Many visitors to Louisiana come seeking a swamp experience, and Slidell is known as one of the best spots in the state to check that off your list. It’s home to Honey Island, a vast, 250-square-mile swamp that’s considered to be one of the most unspoiled, least altered in the entire country. There are multiple tour options for heading out into this moss-draped paradise with majestic cypress trees and winding bayous that’s located just a 35-minute drive northeast of New Orleans. You’ll be able to explore the wild swamps that were once a place where pirates hid while learning about the legends of swamp monsters and viewing all sorts of animals, including owls, alligators, beaver, turtles, boar and a variety of waterfowl. Just south of New Orleans in Marrero is the Barataria Preserve, one of six sites that make up Jean Lafitte National Historical Park and Preserve, a 23,000-acre wetland preserve that interprets the culture of the Louisiana people from past to present who settled in the area, as well as the unique ecosystem that sustained them. One of the best places for enjoying nature and a walk, it preserves a quintessential example of the delta environment, with various boardwalk trails that will lead you through bayous, swamps, natural levee forests and marshes, for a glimpse of the state’s wetlands you typically wouldn’t be able to experience otherwise. There are also plenty of animals that you may be able to glimpse, though the area is particularly abundant when it comes to amphibians and reptiles. Green anoles, tree frogs, water snakes and alligators are the most commonly seen in the preserve. Of course, the American alligator is what steals the show here. Thanks to 30 years of protection, the alligator population is thriving and can frequently be witnessed as they sun themselves along the banks of the waterways, or are partially submerged in the water. Watch for the eastern grey squirrels and nine-banded armadillos that forage near the trails. While many of the large mammals are nocturnal and elusive, you may be able to see white-tailed deer and coyote too. If you’re a birding enthusiast, Barataria is a must-experience as more than 200 species of birds use the preserve’s vegetation and waterways for nesting and foraging. Egret, ibis and heron often wade along the canal banks and feast their way through the swamps, while songbirds can be heard, though less often seen in the forests, like the colourful painted bunting. As the preserve lies in the an ecologically significant estuary, rich fertile waters where bayous and rivers greet the see, crabs, fish and other marine life may be seen just by peering into the water from one of the bridges. These are essential nursery grounds for shellfish like shrimp and blue crabs as well as gar fish and speckled trout. 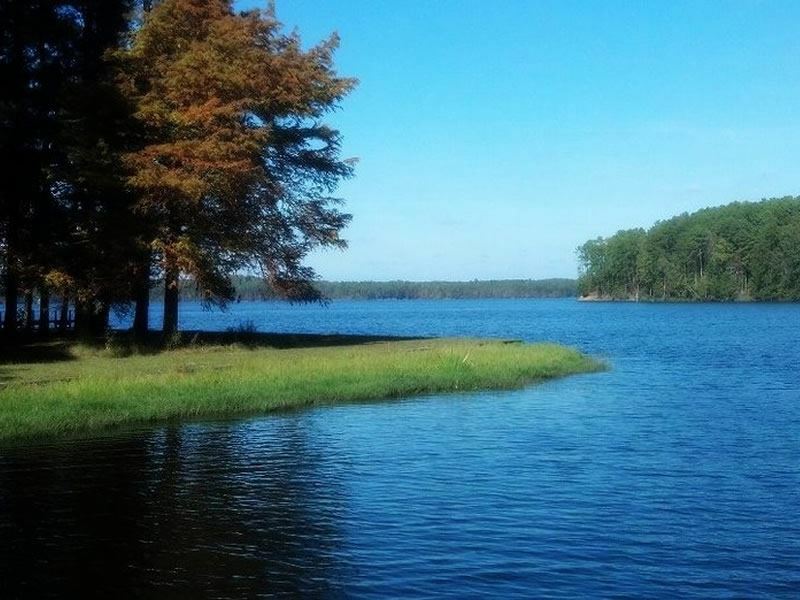 If you want to soak up Louisiana’s natural splendor while enjoying a variety of activities like hiking, swimming and boating, be sure to visit Lake Claiborne State Park. The park sits along the southern shoreline of Lake Claiborne and offers both canoe and boat rentals as well as a protected swimming area to cool off on a hot day. It also hosts a sandy beach, scenic nature trails, guided hikes and picnic areas. You can even rent a cabin and spend the night if you want to stick around longer to take in all that it offers. The two-bedroom cabins are tucked among the pine trees, with many providing a picturesque view of the lake. 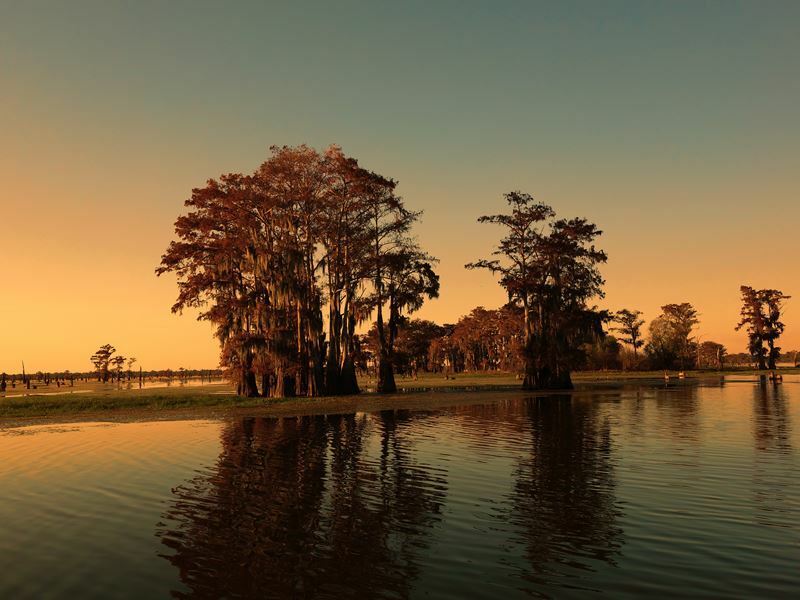 Located in the south-central part of the state, the Atchafalaya Basin is America’s largest swamp. 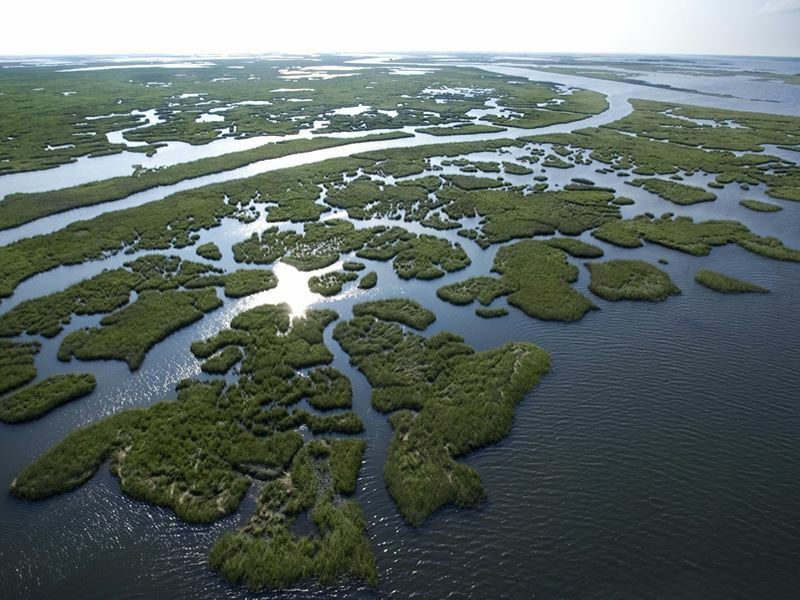 It’s a particularly unique ecosystem due to its unusual combination of a growing delta system and stable wetlands. 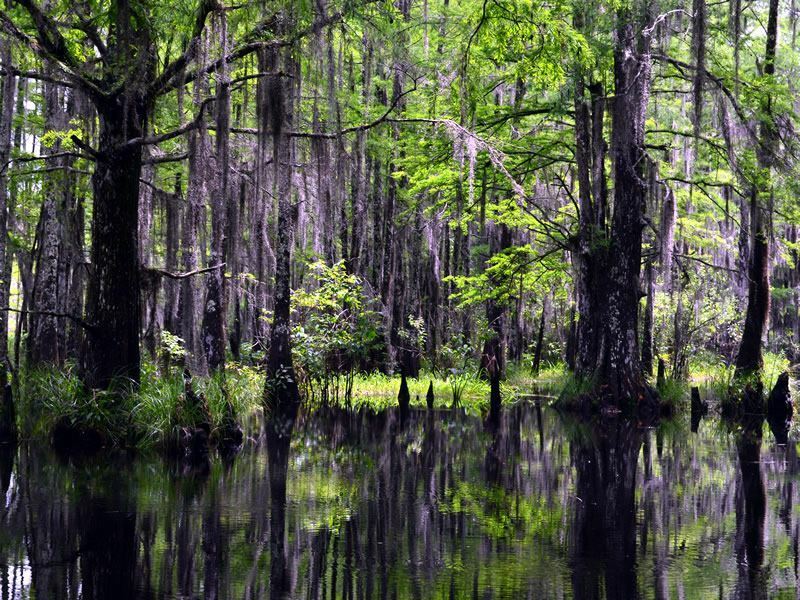 The basin is most well-known for its 260,000 acres of cypress-tupelo swamps, and it also hosts bayous, marshes and brackish waters that join the waters of the Gulf of Mexico. 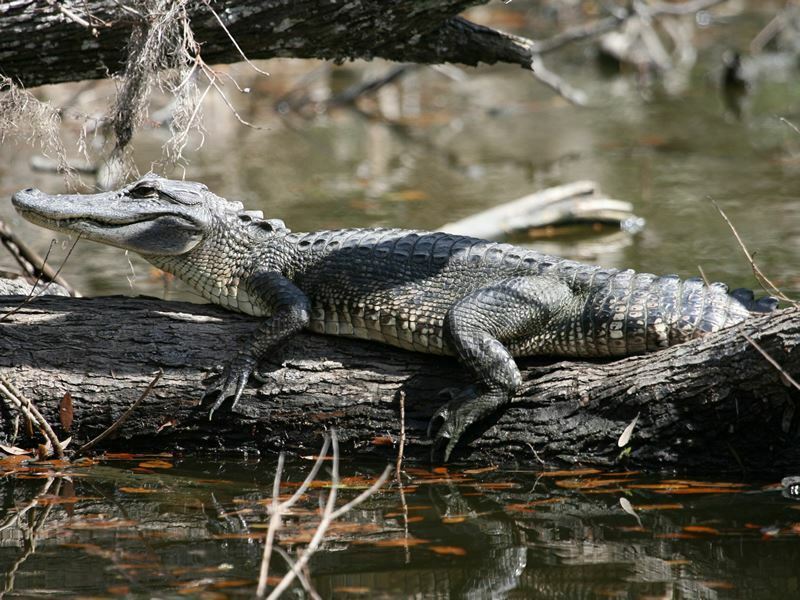 One of the most popular attractions here is the Atchafalaya National Wildlife Refuge, habitat for waterfowl and an extensive array of migratory birds, along with alligators. The Louisiana black bear roams the Basin’s forest. There are some 65 species of amphibians and reptiles here, as well as other mammals like beaver, otter, raccoon, fox and muskrat. More than 250 known bird species fly throughout the Basin, and it’s also home to the largest nesting concentration of bald eagles in the south-central U.S. The Kisatchie National Forest is spread across central and northern Louisiana as the state’s only national forest. It spans over 600,000 acres of rolling hills, soaring pines, and bayous, all filled with wildlife. The diversity of aquatic, riparian and upland habitats of the forest make it an ideal home for all sorts of animals. Hike any one of the miles and miles of trails, keeping an eye out for the creatures that live here, including turtles, salamanders, fox, coyotes, otters and the more elusive Louisiana black bear, wild boar and bobcat. While this area is far too large to experience it all in one trip, some of the best trails include the stunning Wild Azalea Trail located in the Castor Creek scenic area. With many points for joining it, you can make your trek as long or as short as you wish. It passes alongside tranquil streams, traversing flat to rolling terrain, meandering through pine hills, managed forest and untouched areas. The Backbone Trail showcases lush forest and bluffs that lie just outside of the Kisatchie Bayou, stretching for just over seven miles. An extended hike can be taken after this trail ends by joining the Caroline Dorman Trail, adding another 11 miles, eventually looping back toward the original trailhead. The highest mountain in Louisiana is 535-feet tall, considered a hill in most states, but it stills offers some beautiful views of the area, with a hike to the summit here relatively short and easy. There is about a mile of marked trails which guide hikers up and down the mountain, with two different options, the more difficult marked with blue signs although it’s not overly challenging. At the top, you’ll be able to view an endless sea of trees and Mount Jordan in the distance. Tunica Hills is characterised by rugged hills, ravines, bluffs and waterfalls, lying at the southern end of the Loess Blufflands escarpment which follows the Mississippi River’s eastern bank south from its confluence with the Ohio River. It’s a unique wonderland of unspoiled nature and diverse wildlife that’s popular for hiking and biking, horseback riding, bird watching and photography. It supports some species of animals and plants that can’t be found anywhere else in the state, including rare birds like the Coopers hawk and worm-eating warbler. Take a stroll on the short nature trail, or one of the three longer hiking trails to take in the scenery and the wildlife which also includes wild turkey and white-tailed deer. The trails can be accessed from Old Tunica Road on the South Tract.